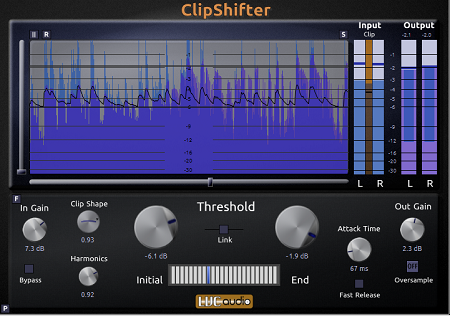 ClipShifter is a clipping-style limiter that provides enough user controls to be useful in all mixing stages. ClipShifter uses a unique threshold control to change the clipping threshold dynamically based on the transient characteristics of the incoming audio. The sonic characteristics of the clipping distortion can be altered from hard, brickwall-style clipping, to softer saturation with compression. Additional parameters allow the user to control the even- and odd-order components of the saturation. Tracktion 4 features the same operational characteristics as the original program but with an entirely new audio engine. This progression is intended not only to make T4 compatible with all the latest operating systems, plug-in and controller technology, but also to create a modern platform for further development. TSC is dedicated to the continued evolution of the product. REAPER is digital audio workstation software: a complete multitrack audio and MIDI recording, editing, processing, mixing, and mastering environment. Would you like an authentic drummer at hand? Volko Alaturka Drum is waiting for you, with its high quality sounds, user friendly interface and its pre-installed ready to use authentic rhythms. With only a few steps you can include your authentic drummer in your music. Volko Alaturka Drum adds new colours to your music by bringing the rhythms of Middle East, North Africa, Arabia and Anatolia. Just select the rhythm you would like and push the "play" button. Following the success of Toontrack’s EZmix, the new and completely overhauled EZmix 2 continues to build on the same fundamental idea: having pro-designed effect chains for instruments and channels found in every recording session combined in one powerful mixing tool. With the vast collection of ready-made presets, mixing music is not only easy and incredibly fast – you end up with results second to none. Designed by Supreme the Beatmaker, the legendary hip-hop producer and beatmaking teacher from Sunz of Man / Wu-Tang Clan fame. Create your own hip-hop beats using 16 realtime pads (12 for Android 2.x and 3.x), piano keyboard and the visual Grid editor. PSP SpringBox is an emulation of a hardware spring reverberator (VST, AAX and RTAS for Windows; AudioUnit, VST, AAX and RTAS for Mac OSX). It recreates several features typical of a spring reverb, such as a convincing “boing” on transients and a repeatable resonating musical character with an adjustable presence. A selection of configurations from two to six springs total is provided, as well as the ability to set stereo spread and pan/balance configured to suit various mix setups - from a typical guitar reverb to a creative uses as a send reverb in the mix. Thanks to PSP SpringBox’s two channel A and B settings setup and range of presets operation is fast and easy. Loaded with a large set of possibilities to create you own songs whenever you want and wherever you are while having the option to continue working on the song in other DAW program, such as FL Studio and Cubase. High quality 16 bit sound, 44.1 kHz bit rate, stereo playback and exporting. 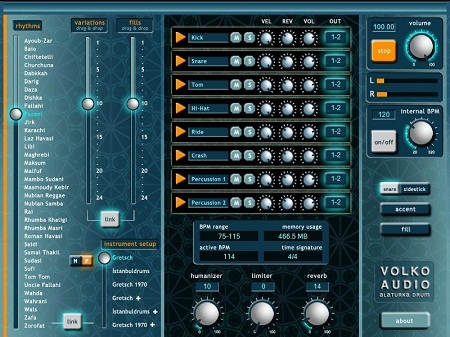 Eurydice is a versatile multi-effect dedicated to sound mangling. It relies on two parallel processors, each one combining a granulizer/stutter effect, a multimode filter, a bitcrusher and a LFO to achieve Lo-Fi artifacts as well as a wide range of drills and glitches. Why DC8? DC8 was designed for transferring your old vinyl records to CD's, doing 78 or cylinder restorations, cleaning up old radio shows, and even restoring your old reel-to-reel tapes. You can record, edit and playback alls kinds of files with the right tools to restore them to their original (or better) lustre. DC8 can be your audio media center. This new VST Plugin from Sonshayne Sounds fills the gap between too simple and too complicated delays/echos. Using crystal clear sound, this effect unit offers all of the most needed echo/delay studio effects in one box including doubling, delays, echos, left-right and right-left echos plus tape streaming effects with sound reinjection.